Marvin Bartley has revealed referee Andrew Dallas was on the verge of halting the Edinburgh derby after Neil Lennon was struck by a coin. Rangers have been credited with an interest in Brentford midfielder Lewis MacLeod, according to reports. he Ibrox side have also been linked with a return for MacLeod’s fellow ex-Gers midfielder Steven Davis. Brendan Rodgers is hopeful that on-loan Manchester City winger Daniel Arzani has just twisted his knee, after the Manchester City kid was stretchered off after coming on as a sub against Dundee. There were initial fears the Australia international had done serious damage. Rodgers said: “Daniel looked like he twisted his knee so we just have to assess that. It’s unfortunate he picked up the injury with a run in the game. Jimmy Dunne has said he’d be open to extending his stay at Hearts. The on-loan Burnley defender is on an initial deal until early January but hasn’t ruled out staying in Edinburgh. 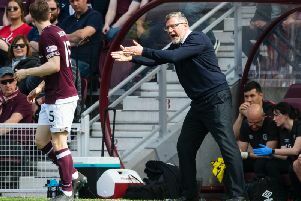 Peter Haring today condemned Wednesday’s scenes against Hibs as “disgusting” and admitted he fears future Edinburgh derbies could be played behind closed doors. The Austrian took the armband after injuries to several colleagues for a game overshadowed by fan disruption the likes of which he has never seen in his career. Aberdeen defender Shay Logan is unlikely to face any further action from his club or the Scottish FA after footage emerged of him making disparaging comments about Rangers. Following the Dons’ Betfred Cup win over the Ibrox side, Logan was seen in a video saying “f**k the Rangers”. Pittodrie boss Derek McInnes said he had spoken to the ex-Manchester City kid.